Craig Young received his B.S. in Biology from Centre College in Danville, KY and an M.S. in Environmental Forest Biology from the State University of New York College of Environmental Science and Forestry. 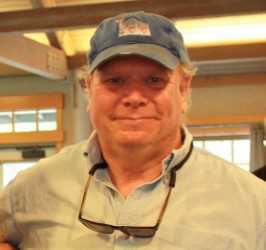 He then worked with Virginia’s Natural Heritage Program as a natural areas manager, and with The Nature Conservancy of Georgia as an ecologist. 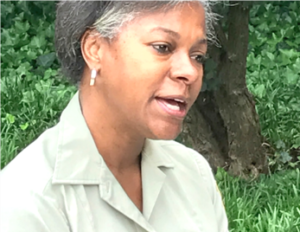 Young currently serves with the National Park Service as a Biologist and Invasive Plant Program Leader for the Heartland Inventory and Monitoring Network. In this role he oversees the Heartland Exotic Plant Management Team, which is dedicated to managing invasive plants across all network parks. The network stretches from Ohio west to Kansas, and from Minnesota south to Arkansas. The size of network parks ranges from 160 acres, to almost 100,000 acres. Young is a strong advocate and voice for Conservation Corps and national service in the Midwest. He is a valuable project partner, host, and mentor for many young people interested in entering the natural resource field. Over the years, Young has helped provided direct service opportunities and mentorship to nearly 200 AmeriCorps members. His dedication to conservation and to training young people has led to a long-term partnership that has greatly enhanced Conservation Corps Minnesota and Iowa’s work throughout the Midwest. Young has specifically chosen to use his limited program funds to partner with Conservation Corps Minnesota and Iowa (CCMI) and has persuaded the individual parks within the Heartland Network to partner with 21CSC programs as well. He and his staff take part in CCMI’s training and orientation to provide expert teaching to over 36 AmeriCorps members each year in topics ranging from GIS/GPS data collection, to chemical application, to best practices in invasive species management. Young and his staff also help Corpsmembers pursue employment with federal resource agencies, offering career advice and guidance in résumé writing and USAJobs applications. 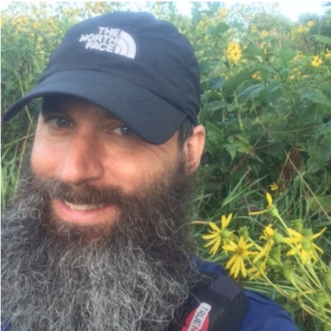 “[Craig] has a passion for and recognizes the importance of providing training, education, and experience for the next generation of conservationists and natural resource managers,” said Mark Wilson, Iowa Program Manager for Conservation Corps Minnesota and Iowa. The winners of the 2019 Champion of the Year Award will be recognized in February in Washington, DC at the annual meeting of the Partnership for the 21CSC (P-21CSC). This meeting is part of The Corps Network National Conference. 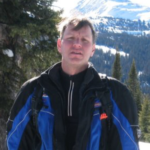 A military veteran, Paul Gritten now serves as the Non-Motorized Trails Program Coordinator for Wyoming State Parks. In this role, he has been an integral partner for the Wyoming Conservation Corps (WCC) over the past decade. Paul helps coordinate comprehensive trainings in trail construction techniques for WCC participants, and has gone above and beyond to find project opportunities for the Corps. Paul’s leadership abilities have been noticed by everyone who serves in WCC’s program. Paul strives to have individual, meaningful connections with each and every Corpsmember. In addition to his connection with the WCC, Paul has also been a key player in the formation of the Wyoming Veterans Trail Crew (WyVTC). This program is run by the WCC for military veterans across the state. Paul’s leadership and council helped lift the program off the ground in 2017. Paul is a dedicated steward of the land who strives to give Wyoming access to sustainable, usable, and inclusive trails. He takes it upon himself to understand the type of users that are using his parks and builds trail systems accordingly. In addition to his inclusive mentality, he is passionate about passing this style of trail building on to anyone he can. 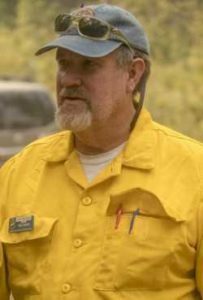 For the past 18 years, Carlos S. Lovato III has been a dedicated employee of the Pecos/Las Vegas Ranger District on the Santa Fe National Forest in New Mexico. 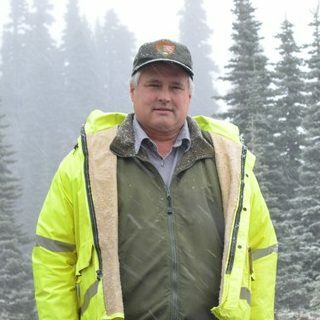 His work focuses on natural resource management, primarily managing watershed and soils for the District, but he maintains an important role overseeing range and forestry resources across an area that includes short-grass prairie, pinon-juniper woodlands, ponderosa pine forests, mixed conifer forests, and sub-alpine and alpine ecosystems. The district also contains a wilderness area, several large burn scars, and the municipal drinking water watershed for the town of Las Vegas. For the past 16 years, Carlos has served as a liaison to the Forest Stewards Youth Corps – a program of Forest Stewards Guild (a 21CSC Member Organization). He has helped hire each Corpsmember, assisted in project development, and provided administrative support. Even as staffing has fluctuated, Carlos has diligently worked year-round on the agency side to ensure the success of this nine-week program. 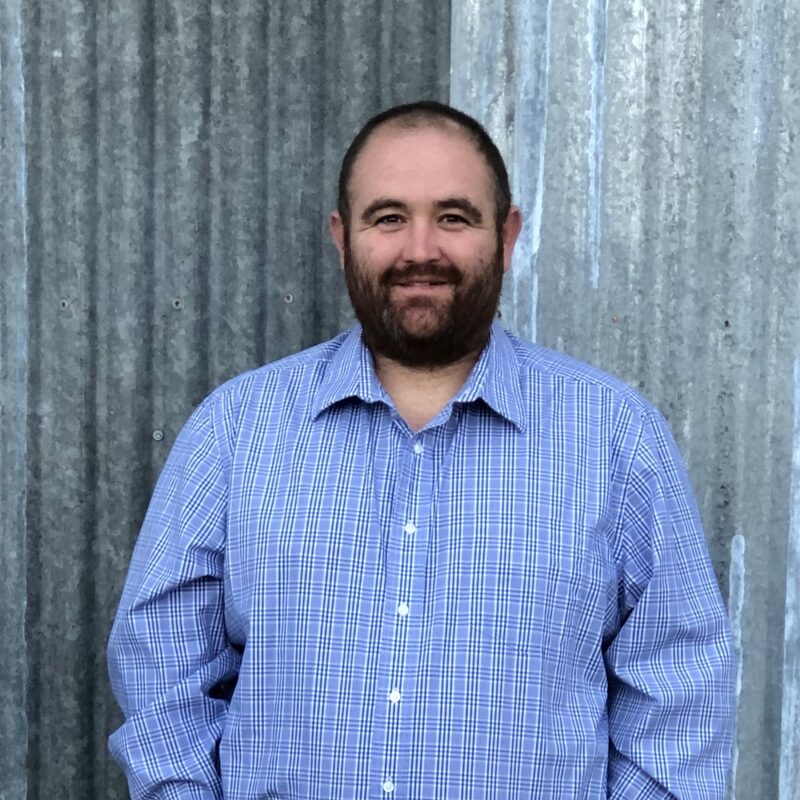 In addition to working with 21CSC Corpsmembers, Carlos has partnered with numerous organizations to engage more youth and volunteers at the forest, and uses his spare time to coach youth sports and support local 4-H activities. 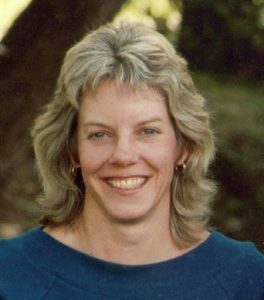 For 26 years, Lisa’s career with the National Park Service has spanned many different programs and projects including park planning, petroleum geology, and overseeing youth programs. 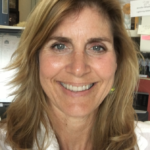 In her current role with the Geologic Resources Division, Lisa oversees two large-scale internship programs. For the last 13 years, she has managed the largest NPS natural resource science internship program, Geoscientists-in-the-Parks (GIP). The GIP Program is managed in partnership with 21CSC organizations Conservation Legacy, Stewards Individual Placement Program, and The Geological Society of America. The GIP program provides internship opportunities to approximately 170 young adults in national parks each year, providing technical assistance to parks to complete critical natural resource science projects. In 2013, Lisa also helped create the Mosaics in Science Program, which, in partnership with Environment for the Americas and Greening Youth Foundation, provides meaningful, science-based internships to racially and ethnically diverse young adults. Lisa has been a dedicated and enthusiastic advocate for youth programming for decades, and the partnerships developed through her creativity and efforts have provided priceless experiences for young adults and helped preserve public lands. Lisa recognizes the benefits of involving future generations in conserving public lands and seeks out opportunities to increase the visibility of environmentalism and youth programming. Greg Sanders started his career in wildland fire working on an engine crew on the Malheur National Forest in Oregon where he worked for seven fire seasons. Since then, he has dedicated his career to forest fire management. He has been integral to the development and implementation of the Veteran Fire Corps programming operated nationwide by a variety of 21CSC member organizations including Conservation Legacy, California Conservation Corps, Student Conservation Association, Mt. Adams Institute and Montana Conservation Corps. With Greg’s support, the Veterans Fire Corps program expanded across the country and has continued to develop and grow in depth and breadth. Greg champions and leads the efforts nationwide to engage veterans in fire programs and has worked to increase opportunities for alumni from these programs to successfully obtain jobs in wildland fire. He has convened federal and Corps partners to discuss best practices and opportunities for collaboration. 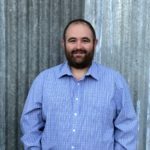 Additionally, Greg developed a system to collect critical program data from across the country that demonstrates the success and impact of Veterans Fire Corps programs. His commitment to ensuring that all veterans who are interested in a job in wildland fire post-program is explicit and his investment has benefited veterans across the country. After serving as a member of the Peace Corps in Gambia, West Africa for 2 years, Paul continued working in the field of forestry and restoration before joining the Forest Service 15 years ago. Paul coordinates the work of the Central Oregon Youth Conservation Corps. Working in coordination with 21CSC partners Heart of Oregon Corps and Central Oregon Intergovernmental Council, Paul oversees projects that annually engage over 100 youth from four counties, with an emphasis on underserved populations. Paul also coordinates with both groups’ year-round Conservation Corps, serving an additional 100 youth annually. Paul has also partnered with such 21CSC organizations as Northwest Youth Corps, Mt. Adams Institute, and Discover Your Forest. He also facilitates, and builds partnership programs with a variety of other youth-serving organizations, including community justice programs and local schools. Through projects as diverse as native seed collection and fence building, to heritage site surveys and riparian rehabilitation, Paul ensures that Corpsmembers experience a range of natural resource career paths, build concrete skills, and learn about themselves as they build relationships with mentors and peers. Paul’s efficiency and collaborative efforts have led to practical “next steps” for youth in the programs he oversees. For example, he coordinates job shadows and has led successful “Career Days” that connect youth with over a dozen different private companies and federal agencies to complete hands-on job training activities. Paul’s commitment to serving youth and creating high-quality educational experiences is apparent in everything he does. 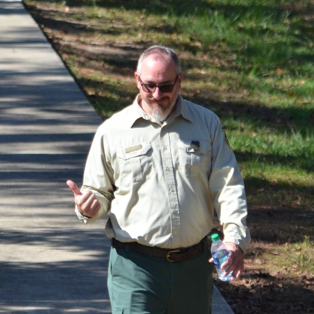 For the past 16 years, Tate Thriffiley has served in a diverse array of positions at De Soto National Forest, working in all aspects of rare, sensitive, threatened, and endangered plants. Recently, he has served as a primary contact for GulfCorps programs, particularly partnering with Community Training Works and CLIMB CDC Conservation Corps on numerous projects. Tate understands what it means to nurture young adults and has consistently displayed patience, creativity, and caring. He also understands the importance of providing Corpsmembers with comprehensive training and certifications. He has brought in trainers to provide all Year-2 GulfCorps members with S-212 Sawyer A-level certification. Some Corpsmembers also received training in prescribed fire. These efforts have allowed the Corps to have a much larger impact than initially anticipated. Corpsmembers have participated in a range of projects, including felling trees, conducting prescribed burns, and mapping and monitoring habitats as part of a multi-year project to restore Pale-topped Pitcher Plant bogs at De Soto. Tate’s impact stretches across all five Gulf states, where over 55 projects are being undertaken by the 10 GulfCorps crews. Dennis Vásquez has worked for the National Park Service in a variety of capacities, including serving as Superintendent of four national park sites: Guadalupe Mountains National Park, Brown v. Board of Education National Historic Site, Bandelier National Monument and White Sands National Monument, and as Trustee of the Valles Caldera National Preserve. In addition, Dennis served as the Program Manager for the National Museum of the American Latino Commission from 2009 – 2011, guiding the Commission members in preparing and delivering a report to Congress and the White House on the potential creation of a national museum in Washington, DC. Over the years, he has served in leadership roles on boards, committees and work groups throughout the country. Since 1992, he has served in a number of consultative roles assisting protected area managers in Latin America. Vásquez is a native of El Paso, TX. Dennis is an advocate for engaging communities who have traditionally not had as many opportunities to connect with our national parks. He helped foster partnerships and develop Southwest Conservation Corps’ Ancestral Lands program, which gives Native American youth the chance to explore their cultures through service. He also worked with Rocky Mountain Youth Corps – New Mexico to launch their Middle Rio Grande Urban Conservation Corps program. In addition, Dennis worked with RMYC to provide opportunities for the Corps’ American Sign Language Inclusion Crew. 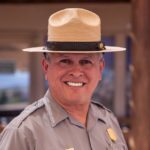 Dennis also served as facilitator for two sessions of the Student Conservation Association NPS Academy conducted at Grand Teton National Park. Many individuals have transitioned from these Corps programs to employment in conservation positions. Dennis strives to serve as a mentor to young people in all these programs and encourages NPS staff and other program leaders to embrace this mentorship role. 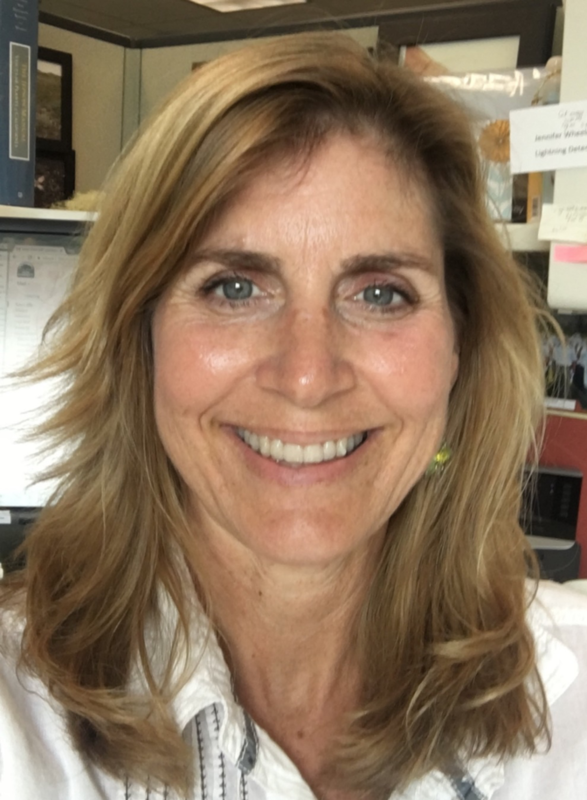 Jennifer Wheeler has worked with the California Conservation Corps (CCC) for over two decades, facilitating life-changing service experiences for rural and urban youth from almost every social and economic demographic within the state of California. She is a champion of Corpsmembers, helping thousands of CCC participants learn about science, nature, strong work ethic, how to communicate properly, how to push yourself through adversity, and most of all, how to be a better citizen and custodian of Mother Earth. For years, Jennifer has been mentoring CCC members, as well as college graduates through BLM’s cooperative agreement with the Chicago Botanic Garden Conservation Land Management (CLM) internship program. 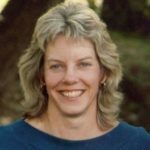 She has provided training and practical experience in the fields of botany, range management, as well as land-use planning, NEPA and ESA regulatory compliance, GIS, and GPS. Notably, Jennifer has worked with the CCC since 1994 on the recovery of coastal dunes and grasslands that provide important habitat for endemic plants, pollinators, and shorebirds. Over the years, these restoration efforts have engaged more than 10,000 CCC members and volunteers. Thanks to these efforts, a 2012 status review recommended the down-listing of the beach laiya – a coastal flowering plant – from endangered to threatened. She also worked with CCC members and other partners on eradicating over two dozen non-native species on over 200,000 acres of public land in northwestern California using manual regimes instead of herbicides. Jennifer is dedicated to providing meaningful, diverse experiences. Craig Young is a strong advocate and voice for Conservation Corps and national service in the Midwest. He is a valuable project partner, host, and mentor for many young people interested in entering the natural resource field. Over the years, Craig has provided direct service opportunities and mentorship to nearly 200 AmeriCorps members. His dedication to conservation and training young people has led to a long-term partnership that has greatly enhanced Conservation Corps Minnesota and Iowa (CCMI)’s programs and work throughout the Midwest. Craig’s leadership and guidance, grew from a few habitat restoration projects each year to a much larger partnership between CCMI and the NPS-Heartland Network. Craig and his staff take part in CCMI’s training and orientation to provide expert teaching to over 36 AmeriCorps members each year in topics ranging from GIS/GPS data collection, chemical application best practices and invasive species management. Craig and his staff also lead a discussion with members on how to pursue employment with federal resource agencies, offering career advice and guidance in résumé writing and USAJobs applications. Craig has specifically chosen to use his limited program funds to partner with Conservation Corps Minnesota and Iowa and has persuaded the individual parks within the Heartland Network to do so as well. Jim Ziolkowski’s career in public lands management started in college when he served as a summer intern with the Student Conservation Association (SCA) at Mount Rainier National Park. Through that experience, Jim realized he wanted to work for the National Park Service (NPS). Since then, Jim has worked with, supported, developed funding for, and nurtured many Corps programs at Mount Rainier, including SCA, EarthCorps, Washington Conservation Corps, and Northwest Youth Corps. 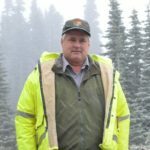 In his role as Trails and Roads Foreman, he has been a tireless advocate and mentor for Corpsmembers at Mount Rainier, providing advice, guidance, and hands-on work experience to Corpsmembers from throughout the region, across the country, and from diverse life experiences. He is committed to supporting initiatives led by partner Corps, such as Northwest Youth Corps, to engage young people from underrepresented groups in the outdoors, including those from the Deaf and Hard of Hearing community and from the LGBTQ+ community. Thanks to Jim, the trails program at Mount Rainier is extraordinarily welcoming of youth conservation service partnerships. Jim regularly prioritizes Corps in the park’s roads and trails budget, making sure trail projects can serve two purposes: getting important work done to ensure the resources of the park are protected and available to the public, and investing in the next generation of park stewards. This entry was posted in 21CSC Champion of the Year on December 12, 2018 by Hannah. [WASHINGTON, DC] – A version of the 21st Century Conservation Service Corps Act, or 21CSC Act (S.1403), passed by voice vote October 2 in the U.S. Senate Committee on Energy and Natural Resources with bipartisan support. Originally introduced by the late Sen. John McCain (R-AZ), the bill can now move forward for consideration by the full Senate. The Partnership for the 21CSC (P-21CSC) applauds movement on the 21CSC Act and extends appreciation to the original co-sponsors – Sens. Michael Bennet, Lamar Alexander and Tom Udall – as well as to Chairwoman Lisa Murkowski and Ranking Member Maria Cantwell for their leadership in advancing the legislation. The P-21CSC also thanks the co-sponsors and supporters of S.1403: Sens. Roger Wicker, Steve Daines, Jon Tester, Angus King, Patty Murray, Mazie Hirono, and Martin Heinrich. The P-21CSC urges the full Senate to pass the 21CSC Act in honor of Sen. McCain, a lifelong advocate of military, national, and public service. As the bill progresses, the P-21CSC encourages lawmakers to consider a Sense of Congress within the bill that honors the late Senator’s legacy and renames the bill appropriately. Additionally, the P-21CSC supports efforts to reconcile the Senate and House versions of the bill. We urge that the final bill include provisions from the original version that would expand national service and AmeriCorps opportunities for young adults and veterans, and enable Corps to better address unmet community and national needs. In June of this year, the House Committee on Natural Resources passed the full 21CSC Act (H.R.2987) with unanimous bipartisan support. Corps are community-based programs that provide young adults and recent veterans the opportunity to serve our country, advance their education and obtain in-demand skills. Serving in crews or individual positions, Corpsmembers complete meaningful terms of service working on projects that address conservation and infrastructure concerns, wildfires and natural disasters, outdoor recreation access, and a range of other issues. During their service, Corps participants gain hands-on work experience and prepare for careers in the growing recreation, natural resource and restoration economies. This entry was posted in 21CSC Act on October 4, 2018 by Hannah. [WASHINGTON, DC] The Partnership for the 21st Century Conservation Corps (P-21CSC) applauds passage of the bipartisan Recreation Not Red Tape Act in the U.S. House Committee on Natural Resources today and thanks Chairman Rob Bishop (R-UT) and the Committee for including the 21st Century Conservation Service Corps Act (21CSC Act) as a provision of the bill. Following passage of the 21CSC Act in the Committee by unanimous consent in January of this year, this movement represents another important step towards the 21CSC Act being signed into law, and provides another avenue for its advancement. Introduced in July 2017 by Chairman Bishop, the Recreation Not Red Tape Act (H.R.3400) seeks to increase access to public lands and outdoor recreation opportunities by streamlining permitting processes and encouraging collaboration between federal agencies and the private sector to support volunteer maintenance of public lands and the engagement of military veterans in recreation and outdoor work in Corps. The bipartisan 21CSC Act (H.R.2987) aligns with these goals in that the bill would make it easier for federal agencies to enter into public-private agreements with Corps and partner on projects to meet agency objectives. The 21CSC Act also prioritizes engaging veterans in the job training and meaningful experiences on public lands that Corps offer. This entry was posted in 21CSC Act on April 18, 2018 by Hannah. Spring 2018: Where does the 21CSC Act stand? The 21CSC Act would allow federal land and water management agencies – like the National Park Service and U.S. Forest Service – to create formal, more flexible partnerships with 21CSC member organizations. It would also enable additional federal agencies to more easily partner with 21CSC organizations to accomplish their goals. Among other provisions, it would expand the number of federal agencies that can work with 21CSC programs and establish standards for data collection and measuring the effectiveness of 21CSC programs. A bipartisan 21CSC Act was initially introduced in the U.S. Senate in August 2015 and in the U.S. House of Representatives in April 2016. In June 2017, a new bipartisan version of the 21CSC Act was introduced in both the U.S. House and Senate, combining the previous version of the bill with the Public Lands Service Corps Act (similar proposed legislation). This updated version of the 21CSC Act represents a bipartisan effort among sponsors and cosponsors of both bills to work together for the advancement of Corps as a public-private strategy to meet the needs of America’s resource management agencies and provide work opportunities for young adults and veterans. Please check out this one pager on the 21CSC Act and share it with your House and Senate members and ask them to cosponsor the bill! This entry was posted in 21CSC Act on March 16, 2018 by Hannah. 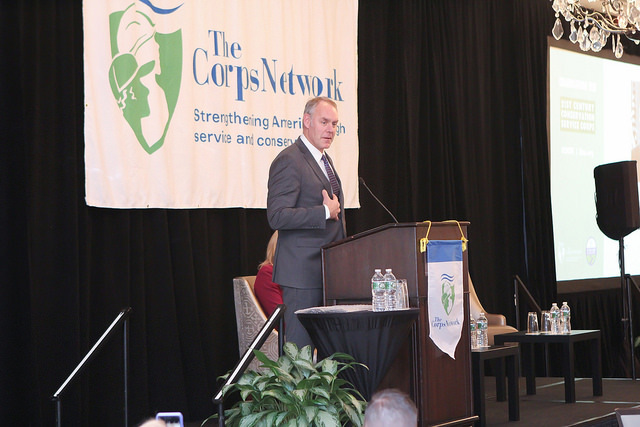 Secretary of the Interior Ryan Zinke gives keynote at 2018 Partnership for the 21CSC Meeting, part of The Corps Network National Conference. The Partnership for the 21st Century Conservation Service Corps (P-21CSC) is a collective of key federal, state, local and non-profit leaders that supports the development and implementation of the 21CSC. In conjunction with The Corps Network National Conference in Washington, DC, the P-21CSC holds an annual meeting to honor important leaders in the Corps movement, review 21CSC accomplishments and goals, and discuss priority issues. This entry was posted in Uncategorized on March 16, 2018 by Hannah. What do Forest Service units gain by working with 21CSC partners? This entry was posted in Quarterly Bulletin on March 14, 2018 by Hannah. 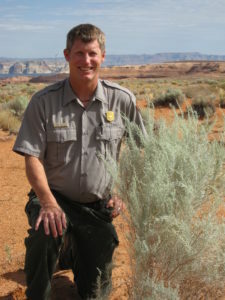 Lonnie Pilkington is the Natural Resource Manager at Glen Canyon National Recreation Area. Lonnie is a 21CSC Champion of the Year for 2018. This Award recognizes individuals from agencies and organizations that partner with 21CSC programs to help engage the next generation of conservation and community leaders in service, education and training. The 2018 Champions of the Year will be recognized at the annual Partnership for the 21CSC Meeting, happening February 12, 2018 in Washington, DC. This event is part of The Corps Network National Conference. Learn more about Lonnie – Click here. 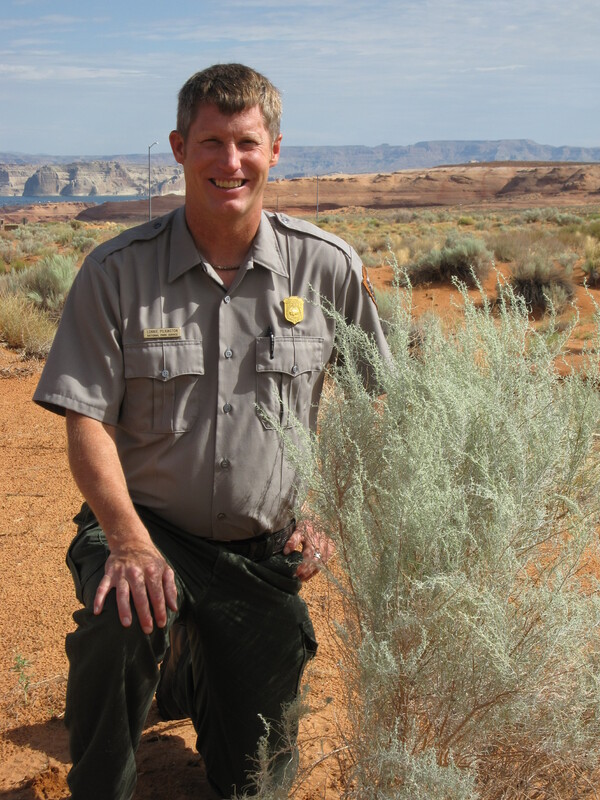 As the Glen Canyon National Recreation Area (GLCA) and Rainbow Bridge National Monument (RABR) Natural Resources Program Manager, my focus areas are: invasive non-native plant control, ecological restoration, wildlife surveys, and endangered species monitoring. I am very fortunate to work for a park and a supervisor that encourage me to connect youth to their National Parks through conservation and education activities. From an early age I developed a strong connection with the great outdoors. This connection was enhanced in the early 1990s while working at the YMCA of the Rockies in Northern Colorado. During this time, I spent weekends recreating in Rocky Mountain National Park and began to develop a strong interest in the local flora and a love for public lands. In 1999, I was hired into my first position (i.e. Laborer) with the National Park Service (NPS) at Rocky Mountain National Park. In 2000, I began working for the Science and Resource Stewardship Division, where I was introduced to disturbed lands restoration. In the early 2000s I served as a Prescribed Burn Crew Technician for The Nature Conservancy (TNC), which sparked an interest in conserving rare species. In the mid-2000s, Colorado State University (CSU) provided me with an opportunity to strengthen my understanding of the environment through conducting habitat restoration research. Through these experiences, I developed a strong interest in habitat conservation efforts and public lands management, which provided a path to where I am today. Along the way, I have been fortunate to work with a number of great supervisors, mentors, and co-workers and for that I am thankful. Early in my NPS career, I was fortunate to work alongside youth from Larimer County Conservation Corps, Rocky Mountain Conservancy Conservation Corps, and Colorado Mountain Club Shining Mountains Group. These partnerships enabled us to collectively complete critical conservation projects, and personally sparked an interest within me to engage youth and adults in conservation efforts. In 2010, I began working at GLCA and RABR and was encouraged to connect youth to their National Parks through resource stewardship, citizen science, and education. I am fortunate to work at a location where numerous federal and non-federal organizations are interested in partnering to engage youth in conservation work on public lands. Over the past several years multiple Service and Conservation Corps have learned about and contributed to: invasive non-native plant control efforts along the Colorado, San Juan, and Escalante Rivers; native plant restoration efforts along hiking trails at RABR; citizen science based acoustic bat monitoring and bird survey efforts along the Colorado and San Juan Rivers; and aquatic invasive species education and containment. I encourage land managers to develop and foster partnerships with multiple local, regional, and national organizations that engage youth in conservation efforts. I also recommend reaching out to your national and regional youth and volunteer program managers. These support staff will assist you in locating 21CSC programs, provide information on federal and non-federal fund sources, and assist with partnership and program development. I encourage land managers to provide Service and Conservation Corps a well-rounded experience that includes service, training, education, and outdoor recreation. Partnering with 21CSC programs provide numerous benefits and enables partners to collectively connect youth to their public lands through engagement in resource stewardship, citizen science, outdoor recreation, and career development opportunities. These experiences can and will change lives and are integral in cultivating the next generation of NPS Ambassadors. I encourage youth to find a discipline they are passionate about and chase their dreams. Serving in a 21CSC organization is a great way to obtain a wide variety of experiences, acquire valuable training, develop skills, contribute to public lands conservation efforts, and meet the players in your field of interest. I encourage youth to develop the qualities (i.e. self-starter, team player, strong work ethic) and skills (i.e. communication [oral and written], leadership, education) that catch the eye of managers and potential employers. I urge youth to apply for numerous positions at a variety of locations to ensure they have options. I recommend actively working with your supervisor to seek out training and career advancement opportunities. I advise finding a mentor and working together to develop and carry out a path to permanent employment. Thank you to all the great Service and Conservation Corps that have played an integral role in restoring and protecting our national treasures! This entry was posted in 21CSC Champion of the Year on January 31, 2018 by Hannah. 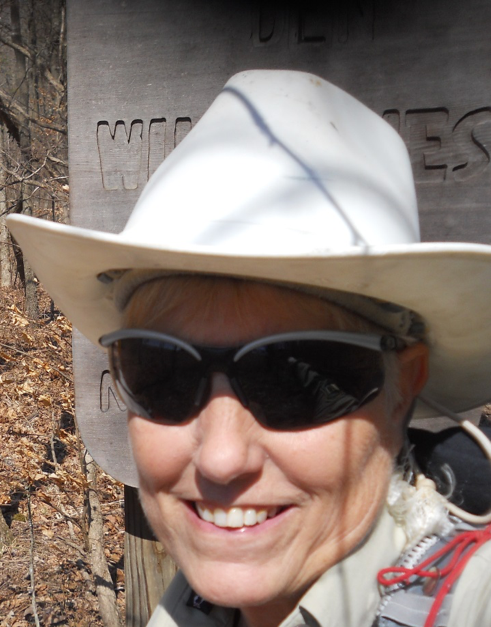 Kelly Pearson is the District Wilderness Technician and Volunteer Coordinator at Shawnee National Forest. Kelly is a 21CSC Champion of the Year for 2018. This Award recognizes individuals from agencies and organizations that partner with 21CSC programs to help engage the next generation of conservation and community leaders in service, education and training. Learn more about Kelly – Click here. I am the District Wilderness Technician and Youth, Hosted and Volunteer Coordinator for the Hidden Springs/Mississippi Bluffs Ranger District of the Shawnee National Forest. I manage seven Congressionally-designated wilderness areas to ensure the Forest is following the mandate of the 1964 Wilderness Act and the 1990 Illinois Wilderness Act to protect the character of each space. As the Youth, Hosted and Volunteer Coordinator, I am responsible for recruiting volunteers for service projects, developing short and long-term service projects, and developing and nurturing partnerships. In 2017, 604 volunteers contributed 12,457 hours of service towards wilderness stewardship, conservation education, wildlife habitat management, customer service and archeology. As a student in high school, my first “real” job was an enrollee in the Youth Conservation Corps for the Shawnee National Forest, stationed in the exact ranger station where I currently work. My experiences that summer solidified my passion for natural resource management and land stewardship. Most importantly, it taught me the values of teamwork, self-confidence, and a good work ethic. I continued for the next few summers in the Youth Conservation Corps as a Crew Leader, eventually transitioning to the Young Adult Conservation Corps. These positions were important in forming my leadership skills and helping to connect others to the natural world. After a 10 year period away from the Forest Service, I was recruited for a seasonal position. Now, 26 years later, I feel very fortunate to have a job that I am so passionate about. The volunteer program on the Shawnee NF, also known as the Shawnee Volunteer Corps, is built on the foundation of teamwork, leadership, stewardship, partnership and education. This foundation is a solid match for the different Corps that we have hosted. The Shawnee Volunteer Corps provides experiential service where, no matter if you are providing four hours or four months of service, you are guaranteed to learn something about yourself, the local natural and cultural history, and feel great at the end of the day. Since 2005, we have hosted St. Louis AmeriCorps Emergency Response Teams; AmeriCorps NCCC teams, who are immersed in the wilderness for a week; AmeriCorps VISTA participants; and VetsWork participants from Mt. Adams Institute. Through my experiences working with different Corps, I have found that it is always important to make sure you are ready before you begin hosting teams. Do you have the projects, the leadership, the tools, etc. With that said, you must also remain flexible. The Corpsmembers arrive with all levels of skills and abilities and backgrounds. Keeping your expectations real is important, but what is most important is that everyone on the team feels valued and can connect with the project. I like to focus on the outcomes more than the outputs. For the Shawnee NF, partnering with 21CSC organizations is integral to increasing capacity. Many hands make light work, as they say. In addition, it is our chance as an agency to connect with potential future leaders in the conservation community. I highly recommend a four-year degree as a great starting point. In addition, volunteering is very important to potential employers. Being willing to spend your own personal time doing conservation service, or any service, says a lot about a person.